added Proxy Checkbox now prompts with file discovery allowing you to choose a file outside of the same directory Persona is in. added indicator that displays if proxy-less version is online or not. 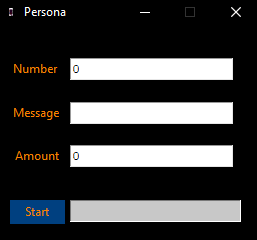 added fixed timer if no more numbers are available; If you're presented with STATUS:OFFLINE now the process will not end instead the program will remain idle until more numbers are disposable. Proxy support now gives you the ability to send up to 4 messages from the same proxy before moving on to the next one. Without using a proxy you can send up to 2 messages from the same number. I`m interested . How much ? (10-23-2017, 11:07 AM)blaksatyn Wrote: [ -> ] I`m interested . How much ? Would you like to see a preview before purchasing? I like to let my clients know what they are buying before they do. Yes , and I wanna know how many SMS can you send ? (10-23-2017, 11:11 AM)blaksatyn Wrote: [ -> ] Yes , and I wanna know how many SMS can you send ? there is no limit to how many sms messages you can send. Shame (for my usability) It's only compatible with US numbers. I wish you all the best with your sales. (10-23-2017, 11:24 AM)mothered Wrote: [ -> ] Shame (for my usability) It's only compatible with US numbers. As such, you'll generate a lot more sales. included a video hope you guys like it! Seems like an interesting program. I personally don't have use for this but I have to say I do like your thread design a lot, did you design it yourself? Good luck with sales nonetheless.